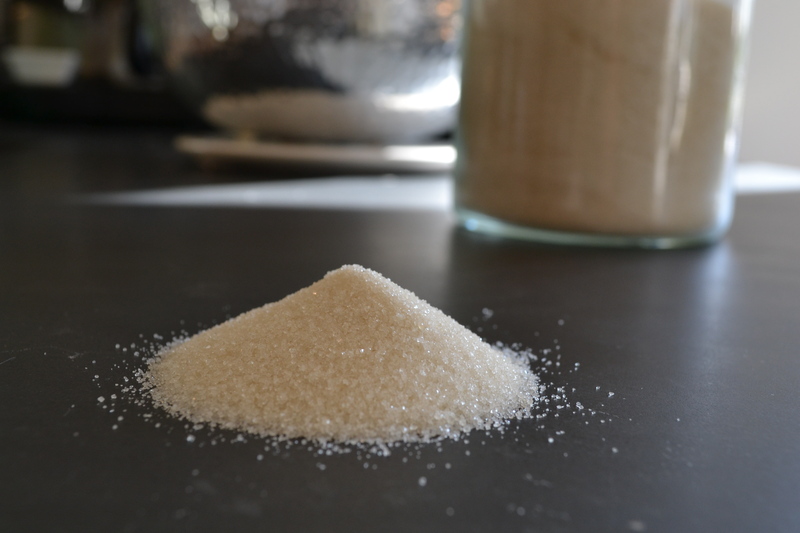 Sugar (Part I): How much is too much? Maybe it’s in poor taste to write about the evils of sugar just on the heels of the holiday season and a week before that box of Valentine chocolates appears. Then again, as I find myself with a heightened sweet tooth–after a period of undoubtedly indulging in too many holiday cookies–made with love and care by myself or a friend, I think this is the perfect time to raise awareness about how much is too much when it comes to sugar, and what the health effects are. I constantly have people saying to me–usually in reference to what I am or am not allowing my children to eat, “A little sugar isn’t going to kill them” or “At least it’s organic sugar.” What I feel many people don’t understand is that sugar really is bad for you. Most people seem to focus on the high number of calories contained in sugar or its potential adverse effects on tooth enamel. Evidently their primary concerns are weight and cavities. But I believe those are the lesser evils of sugar. Excessive sugar in our diets leads to insulin resistance, promotes inflammation (a primary precursor to major diseases, such as heart disease and cancer), can lead to excessive weight gain, contributes to non-alcohol related fatty liver disease, may act as fertilizer for cancer cells, and may speed up aging. In 2009, the American Heart Association (AHA) reported that the average adult in America consumes 22 teaspoons of added sugar each day, teens a whopping 34 teaspoons! The biggest culprit in these numbers turns out to be soft drinks. A regular 8-oz soft drink contains 8 teaspoons of sugar. That is nearly the daily recommended amount of sugar for men and it’s two teaspoons over the daily recommended amount for women. If Americans followed the AHA’s new guidelines, the average person would cut their consumption of added sugar, by more than 70 percent! Researchers also have found that the higher in sugar a person’s diet, the lower his/her blood levels are of High-density lipoprotein, or HDL, the good cholesterol that transports dangerous cholesterol away from the arteries. Research has also shown that as dietary sugar levels rise, so do the level of triglycerides, the fat that circulates in the blood. Both low HDL cholesterol and high triglycerides significantly increase the risk for heart disease. If higher risks of obesity and heart disease aren’t enough to scare you, experts now believe that a high-sugar diet leads to rapid aging of the skin. This happens through a natural process called glycation, in which sugar in the bloodstream attaches to proteins to form dangerous new molecules called advanced glycation end products (AGEs very appropriately, for short). The more sugar a person eats, the more AGEs he/she develops. Collagen, the protein fibers that keep skin firm and elastic, is the most vulnerable, in part because it is the most prevalent protein in our bodies. Loss of collagen and elastin results in wrinkled and sagging skin. Studies have shown ingesting significant quantities of sugar can reduce the ability of white blood cells to kill germs by 40 percent and that the immune-suppressing effect starts within 30 minutes of ingestion, and may last for as many as five hours. In contrast, ingesting complex carbohydrates or starches appears to have no effect on the immune system. Added sugar is in pretty much any food that’s been processed, including salad dressings, crackers, spaghetti sauce, breads and many peanut butters. Take yogurt for example, a single serving of Brown Cow organic yogurt (flavored) contains 27grams of sugar! I serve it only on occasion, and it’s served as a dessert. – Take a look at the nutrition information on the box of cereal in your cupboard. Envirokidz Panda Puffs contains 7 grams of sugar per 3/4 cup serving. Since my kids are obsessed with it, I still buy it. But I only serve it once a week, and I mix it 50/50 with Trader Joe’s Joe’s Os whole-grain oat cereal, which has only 1 gram of sugar per serving. – Regular jams contain 12-16 grams of sugar per serving (1 tablespoon). Opt for fruit spreads like organic bionaturae fruit spreads. They contain half that amount, and the sugars are naturally occurring instead of added. – Check the number of grams contained in your regular sandwich bread. Compare with a few others. Some “plain” whole-wheat loaves contain 8+grams per serving. Others contain less than 2. – Serve juice–even 100% natural, unsweetened juice, on occasion only. With juice, you get all the sugar of the fruit with very little else. Your body reacts to the sugars in the juice just as it would straight regular sugar (i.e., insulation spike). Serve whole fruit instead as the fiber in fruit helps regulate blood sugar levels. Whole fruit also contains nature’s mix of vitamins, minerals, enzymes, and beneficial phytonutrients, all of which help moderate the negative metabolic effects of sugar. – Do make your own quick breads (e.g., banana bread) and muffins, pancakes, sauces (e.g., spaghetti, pizza) and cookies since you can regulate how much sugar goes into the mix. I typically cut the amount of sugar called for in recipes by half without negatively impacting texture or taste. – Save candy for special occasions, such as Valentine’s Day and Halloween. In Part II, I’ll describe the different types of sweeteners and how they affect our bodies as well as our palates.